“Only in UPA ruled states farmers are committing suicide in large numbers. But such incidents of suicide are not found in BJP ruled states in the country”, said BJP Prime Ministerial candidate Sri L K Advani. Addressing a massive election rally in support of BJP’s Belguam and Chikkodi candidates, he said UPA failed to give an able and effective government to the country during its rule. By coming to power in Karnataka BJP has come out of the tag of being only a North Indian party, he stated. During the NDA rule under the able leadership of Sri A B Vajpayee the country witnessed all-round progress. It is sad that Vajpayee is not with us today due to his ill health. He further added that country could prosper only when poverty is eradicated and farmer’s condition is improved. BJP will work hard to ensure total development and overall welfare of its people. 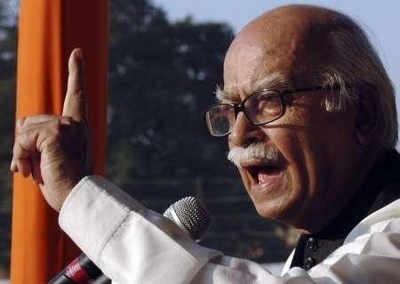 Expressing confidence that NDA will get majority in the forthcoming elections Sri Advani said, “UPA government has completely neglected the safety and security of the country. BJP will bring stringent laws to control the menace of terrorism if voted to power”. Criticizing the Congrss and UP government for invoking NSA on Varun Gandhi Sri Advani said it is a shame that the government is dillydallying to hang Afzal Guru who was responsible for attack on Parliament. He called upon the people to vote for the BJP to ensure the development, safety and security of the country.